Since I became a new mommy, I haven’t had a lot of time to do a lot of things that I take for granted when I was a childless. I used to be able to blog a lot more regularly. Ahem. I used to be able to go see my friends for drinks and meals right after a long week at work at the spur of the moment. I used to be able to just make beauty appointments when I’m in need of some pampering. These days, getting my hair and nails did, is a luxury. So I try to look for alternatives to the long, indulgent sessions I used to enjoy. I now look for places that would accept last minute appointments, are generally close to where I live, and have good, no-frills, service. 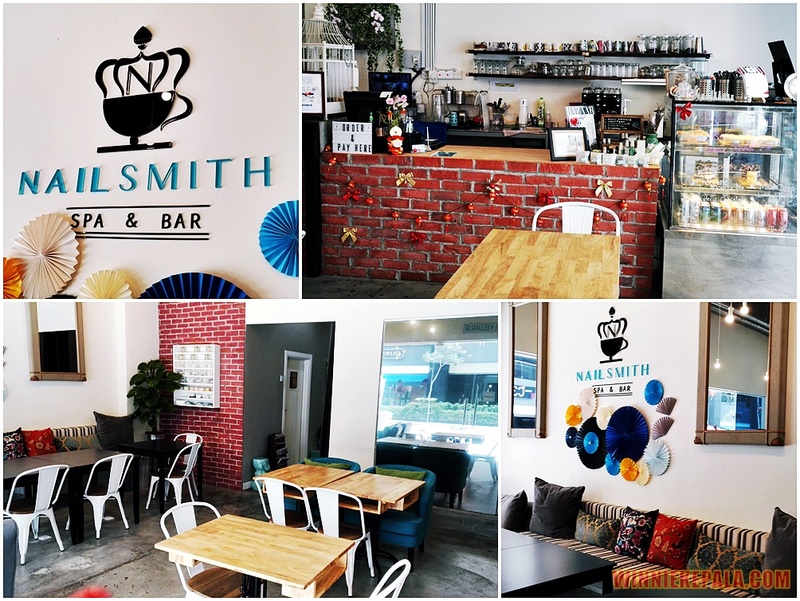 And one such place that I discovered is Nailsmith at Publika. I first came to know of this place via Instagram, when some friends posted their mani/pedi pampering session at a place in Publika. I have been going to The Nail Parlour at Publika for awhile now. Mostly because I can just walk in without an appointment on some days and get my nails done, in and out, relatively quickly. But after getting turned away for my last minute walk-ins a few times, I needed to find a new place. 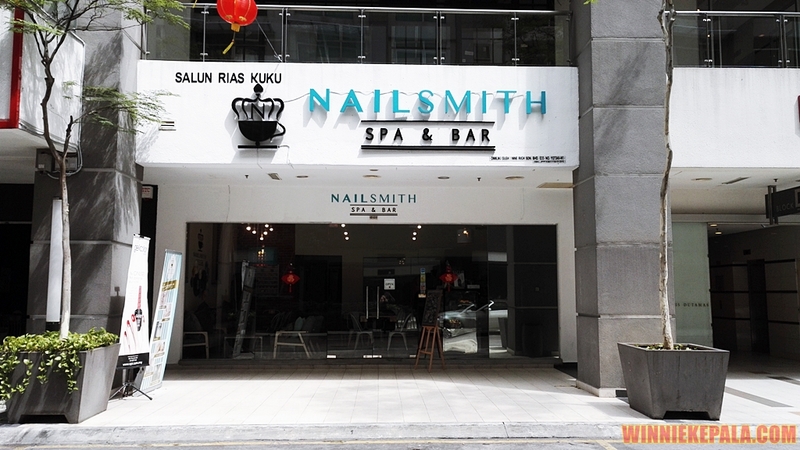 NailSmith is located at Solaris Dutamas at Block D3, to be exact. If you’re like me, and am utterly confused with the blocks and floors at and around Publika. 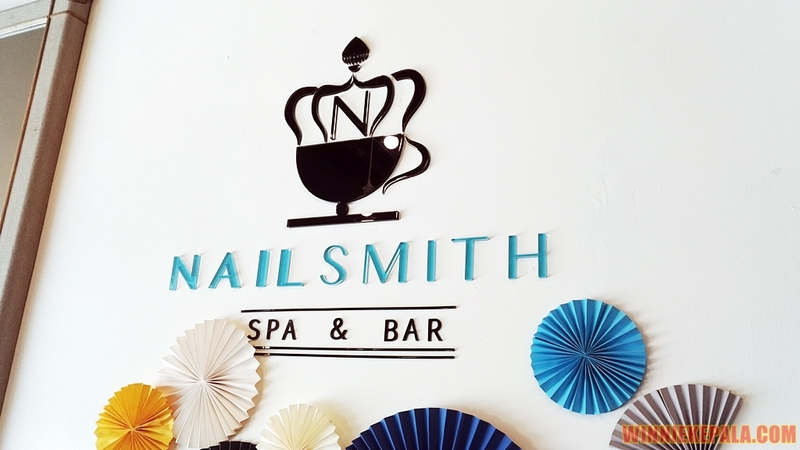 Then, NailSmith is located on the ground level shop lot, at the same side as The Strip, Coffee Stain, Coffee Societe and Mikey’s Pizza. Clear? I truly love that NailSmith has a cafe at the front of the house. There are enough tables and chairs to seat, maybe around 20 people. To allow you have a quick bite of cake and a cuppa joe, while you wait and chill. Or perhaps, even if you’re planning to throw a girlie party, you can celebrate it here. 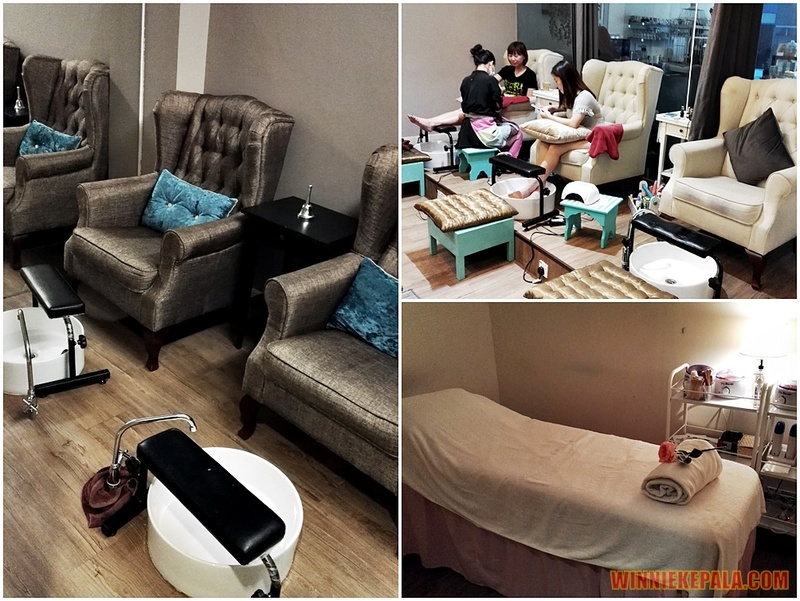 I have personally seen Bridal Showers, Baby Showers and just Girl’s Day Out happen in my last few appointments here. There are high back chairs on elevated platforms, and individual sinks for your pedicures. This common area can house 6 people. Other than Manicure and Pedicure services in the open space, you can also choose to book private rooms (which are a little tight, in my opinion) if you treasure some privacy. 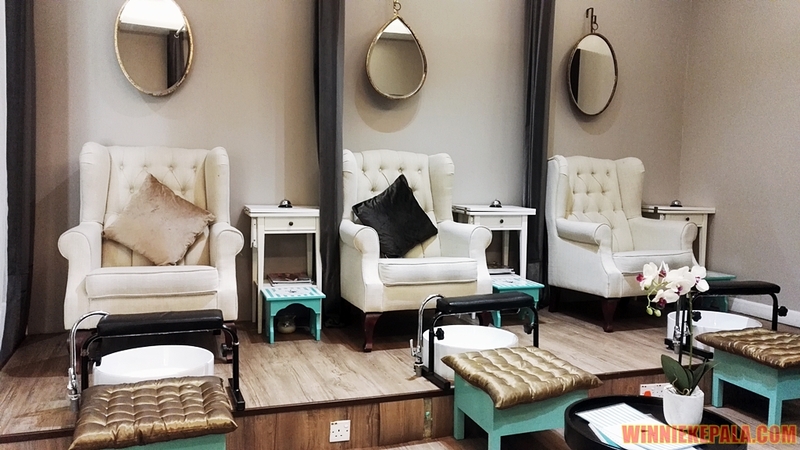 They also offer other facial and waxing services, and have dedicated rooms for those. As if the cafe at the front of the house, and the comfy mani/pedi areas aren’t enough, I was pleasantly surprised to see that NailSmith also has a small play room, with glass walls for the mommies who have their kids with them. It’s a small room, yes, but I’m impressed that there is one in existence. 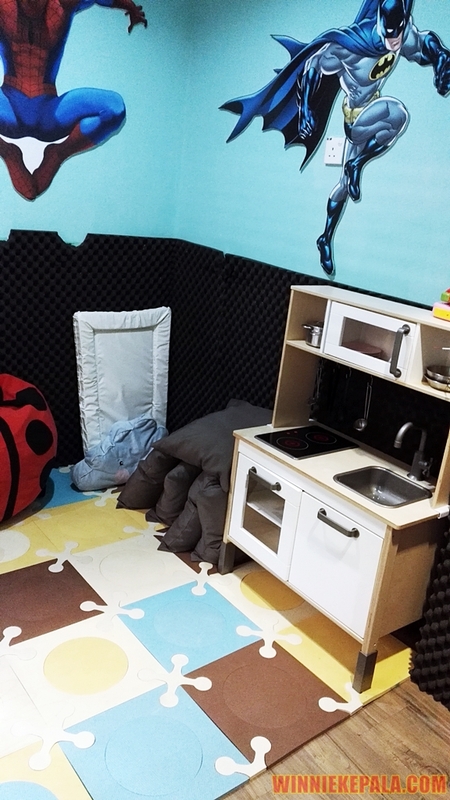 The room has a small playmat area, with miniature kitchen, a TV and some simple toys, cushions and even (as you can see) a baby changing mat. So mommy friendly. I like! Although my baby is not old enough to be left there alone while I enjoy an hour of mommy time, it will likely be convenient for me when #babyHEAD is older to be left alone to play, without bothering mommy. Haha. The first time I was there, I had some time to kill on an early Saturday morning. They were just opening shop, and wasn’t quite prepared for customers yet. The staff were so accommodating, even though they have quite a full appointment for the day. That was from my first visit in February. My red nails in time for Chinese New Year. Not only were they nice to accept me before their first appointment, it was also the busy Chinese New Year period then. 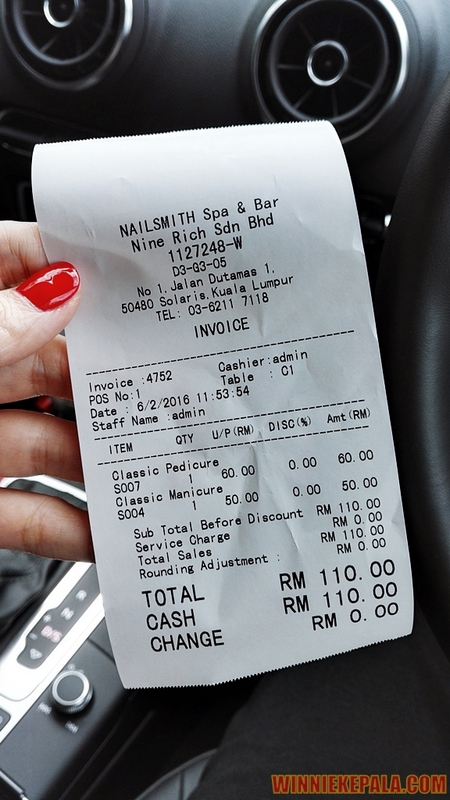 My classic Manicure and Pedicure costs RM 110, which is not bad. I love the ambiance. I love that, in following visits, I got to enjoy a nice hot cup of latte while I’m getting my nails did. I love the friendly staff. I love that they have child friendly room for mommies like me. I love that they have been accommodating in the last few times when I made last minute bookings. I have definitely found my go-to nail salon. Add : Block D, D3-G3-5, Publika Solaris Dutamas, Jalan Dutamas 1, 50480 Kuala Lumpur, Malaysia.